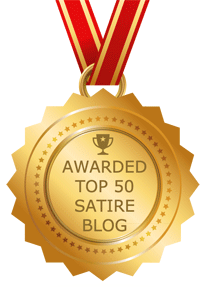 The West Nile, Virus, Bird Flu, Weaponized Anthrax, and Other Things that Make You Go Hmmmm. In 1999 an outbreak of disease previously unknown to North America was identified in New York—the West Nile Virus. You may have since heard of it. In 2001, the anthrax attacks on the U.S. utilized a pure (or even weaponized) form of the bacterium that many experts agree could have only been manufactured under tight laboratory conditions at an expense only possible in a state-sponsored program (as opposed to Bin Laden’s cave-sponsored programs). In 2004, an outbreak of a potentially pandemic viral disease appeared in China before achieving a high fatality rate around the globe (not related to their food industry prowess). Is it possible that these two viral outbreaks and the anthrax attacks were sponsored by foreign government’s bio-warfare research programs? Is there a relationship between these two outbreaks and the anthrax attacks? Are these incidents perhaps bio-warfare ‘research’ studies? Are these geocentralized pragmatic infections establishing a new paradigm in disease propagation? Hmmmm. In recent years, West Nile virus (WNV) has emerged in temperate regions of Europe and North America, and presents a threat to public and animal health. The most serious manifestation of WNV infection is fatal encephalitis (inflammation of the brain) in humans and horses, as well as mortality in certain domestic and wild birds. 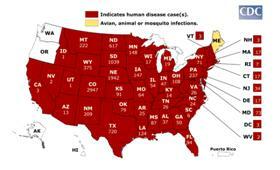 WNV has also caused human illness in the US in recent years (Source: CDC). WNV was first isolated from a febrile adult woman in the West Nile District of Uganda in 1937 (West Nile Nancy). The ecology was characterized in Egypt during the 1950s. The virus was recognized as a cause of severe human meningitis or encephalitis in elderly patients during an outbreak in Israel in 1957 (West Nile Nitza). Equine disease was first noted in Egypt and France in the early 1960s, and by the 1970s it started to effect horses (West Nile Nelly). WNV first appeared in North America in 1999, with encephalitis reported in humans, horses, and a centaur named Bernie. The subsequent spread in the United States is an important milestone in the evolving history of this virus. WNV has surfaced in Africa, Europe, the Middle East, west and central Asia, Oceania (subtype Kunjin), and most recently, North America. (Source: CDC). Outbreaks of WNV encephalitis in humans have recently occurred in Algeria in 1994, Romania in 1996-1997, the Czech Republic in 1997, the Democratic Republic of the Congo in 1998, Russia in 1999, the United States in 1999-2003, and Israel in 2000. Epizootics of disease in horses occurred in Morocco in 1996, Italy in 1998, the United States in 1999-2001, and France in 2000, and in birds in Israel in 1997-2001 and in the United States in 1999-2002. (Source: CDC). 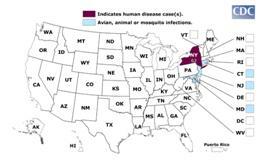 In the U.S. since 1999, WNV human, bird, veterinary or mosquito activity have been reported from all states except Hawaii, Alaska, and Oregon. (Source: CDC; see Figure 1 and Figure 2). Influenza A virus subtype H5N1, also known as A(H5N1) or simply H5N1 (you sunk my battle ship), is a subtype of the Influenza. It is a virus that can cause illness in humans and many other animal species. A bird-adapted strain of H5N1, called HPAI A(H5N1) for "highly pathogenic avian influenza virus of type A of subtype H5N1,” is the causative agent of H5N1 flu, commonly known as "avian influenza" or "bird flu". The first known strain of H5N1 (called A/chicken/Scotland/59) killed two flocks of chickens in Scotland in 1959, before it was cornered in a windmill by a pitchfork and torch wielding mob, where it was eventually burned; but that strain was very different from the current highly pathogenic strain of H5N1. The current dominant strain of H5N1 evolved between 1999 and 2002 creating the Z genotype. It has also been called "Asian lineage HPAI A (H5N1)". Donated to Tyson foods by the Bin Laden Food Corp (Not a joke!). H5N1 is easily transmissible between birds, facilitating a potential global spread of H5N1 (see Figure 3). While H5N1 undergoes mutation and re-assortment, creating variations which can infect species not previously known to carry the virus, not all of these variant forms can infect humans. H5N1 as an avian virus preferentially binds to a type of galactose receptors that populate the avian respiratory tract from the nose to the lungs and are virtually absent in humans. H5N1 is mainly spread by domestic poultry, both through the movements of infected birds and poultry products and through the use of infected poultry manure as fertilizer or feed (Ieatbirdpoopo.com). Humans with H5N1 have typically caught it from chickens, which were in turn infected by other poultry or waterfowl. Migrating waterfowl (wild ducks, geese and swans) carry H5N1, often without becoming sick. Many species of birds and mammals can be infected with HPAI A(H5N1), but the role of animals other than poultry and waterfowl as disease-spreading hosts is unknown. Anthrax is an acute disease in humans and animals that is caused by the bacterium Bacillus anthracis. It is highly lethal in some forms. Anthrax is one of only a few bacteria that can form long-lived spores. When the bacteria’s life cycle is threatened by factors such as lack of food caused by their host dying or by a change of temperature, the bacteria turn themselves into more or less dormant spores to wait for another host to continue their life cycle, or for another Star Trek episode. Anthrax can enter the human body through the intestines (ingestion), lungs (inhalation), or skin (cutaneous) and causes distinct clinical symptoms based on its site of entry. Inhalation anthrax, if left untreated until obvious symptoms occur, will usually result in death, as treatment will have started too late. Theoretically, cultivating anthrax spores can be done with minimal special equipment and a first-year collegiate microbiological education. It wasn’t me, honest! To make an aerosol form of anthrax suitable for biological warfare requires extensive practical knowledge, training and highly advanced equipment (I’m talking to you, makers of the Jack LaLanne Juicer!). Concentrated anthrax spore containing postal letters were used for bioterrorism in the 2001 anthrax attacks in the US, killing five people and infecting 17 others. Only a few grams of material were used in these attacks and it is unknown if this material was produced by a single individual or by a state sponsored bio-weapons program. The crime remains unsolved. But where exactly was Jack LaLanne? WNV ecology was characterized in Egypt in the 1950’s; meaning, Egypt was researching the virus at that time. The 1956 Israel initiated the Arab-Israeli War on October 29, 1956, and a cease fire was eventually signed on November 6, 1956. Israel withdrew from key points in the Sinai Peninsula in 1957. The first WNV outbreak involving severe meningitis or encephalitis occurred in Israel in 1957 (Remember West Nile Nitza?). 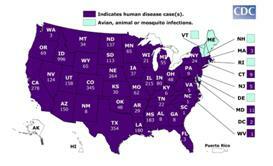 WNV first appeared in the U.S. in 1999. The U.S. Embassies in Dar es Salaam, Tanzania, and Nairobi , Kenya were bombed in August, 1998. The U.S.S. Cole was bombed in Aden, Yemen in October 2000. Hmmmm. WNV first appeared in the U.S. in New York City. The WNV strain in NYC seemed to be unusually virulent, resulting in meningitis or encephalitis and caused 12 fatalities. NYC was the primary target in the 1993 terrorist attack on the U.S. (WTC bombing) and I hear something vaguely related may have happened in NYC in September of 2001. Hmmmm. The 1999 US virus was very closely related to a lineage 1 strain found in Israel in 1998. Hmmmm. 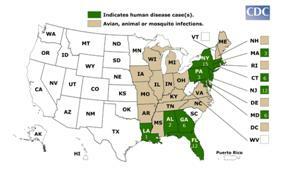 WNV is only transmitted through mosquito vectors, which bite and infect birds/mammals/humans. Not the sort of thing a mildly ill passenger on an airplane (e.g., traveling from Israel to the U.S.) would easily spread to other passengers. Yes, yes, I remember, I had the lasagna. Hmmmm. WNV has three different effects on humans. The first is an asymptomatic infection; the second is a mild febrile syndrome termed West Nile Fever; the third is a neuron-invasive disease termed West Nile meningitis or encephalitis. In infected individuals, the ratio between the three states is roughly 110:30:1 for naturally occurring WNV. Mortality occurs in less than 1% of these clinical cases. In 1999 in NY, outbreak surveillance identified 59 patients who were hospitalized with WNV. 63% of those patients had clinical signs of encephalitis and seven patients died (12 percent). Communicable Disease Program, New York City Department of Health, New York 10013, USA. Hmmmm. In 1985, the U.S. delivered 5 shipments of biological material to Iraq as part of a program to provide aid to Iraq during the Iran-Iraq war. Those shipments included engineered strains of anthrax, West Nile virus, and other pathogens along with the equipment and expertise to manufacture and continue research on these organisms and delivery methods. (CDC) Hmmmm. In the 1990’s, while under intense scrutiny from the U.N., Iraqi dictator Saddam Hussein bragged to Arab leaders that he had “his final weapon, developed in laboratories outside Iraq.” There were several independent intelligence reports at that time that indicated that Iraq was sponsoring a biological weapons program outside of Iraq in order to avoid U.N. scrutiny. During that same period, Iraqi scientists and technology were frequently traveling between Cuba and Iraq. Hmmmm. There have been many scientific reports documenting serological evidence that WNV, in various forms, is present in Cuba, Puerto Rico, and the Florida Keys. It is considered highly unusual that these differing strains would be present in the Western Hemisphere unless there is some periodic re-infection. Hmmmm. The Chinese government was one of the first signatories to the Biological and Toxic Weapons Convention in 1972. China has repeatedly denied an offensive biological weapons program since that time. However, Soviet Union weapons experts have reported the known existence of a biological weapons facility located in a remote region of China in the 1980s. Coincidentally, in that very same region of China during that time, there were two separate documented outbreaks of viral hemorrhagic fever; a rare and deadly disease typically caused by a viral pathogen. Hmmmm. The very same technologies and methodologies necessary to manufacture and prepare viral hemorrhagic fever pathogens can also be used to manufacture and prepare other viral infections, such as H5N1. Hmmmm. Figure 2. 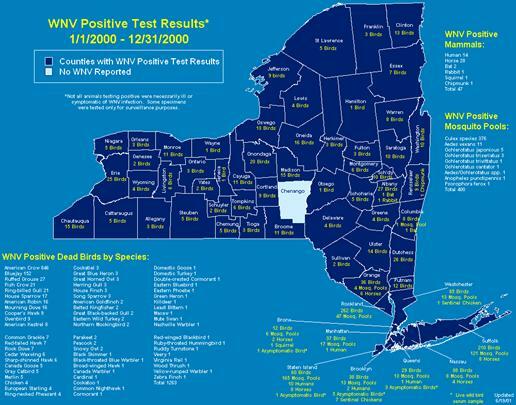 2000 WNV Case Map for New York. Figure 3. 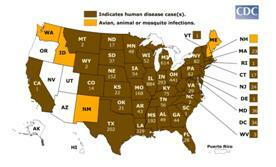 H5N1 Case World Map. Countries with poultry or wild birds killed by H5N1. Countries with humans, poultry and wild birds killed by H5N1.